ATLANTA—Tuskegee University’s president, Dr. Lily D. McNair said that it’s a misnomer to think that historically Black colleges and universities don’t have their share of challenges when it comes to issues around diversity and inclusion. 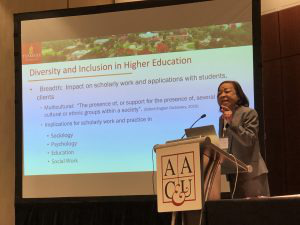 “People think they don’t have to think about diversity,” said McNair, in a speech delivered at the 105th annual meeting of the Association of American Colleges and Universities (AAC&U). “Diversity is much more than race and ethnicity,” she said, adding that at Black colleges like Tuskegee, religion, socioeconomic status and geographic differences are often closely examined by students, staff and faculty. “If there are 10 African-American students sitting together, there are also 10 ways that they are different from each other,” she said. McNair—who is Tuskegee’s first woman president—said that ongoing conversations about diversity and inclusion are often conflated. She said that institutions have to be willing to integrate the goals of diversity and inclusion with their mission statement and values. Including the campus community in strategic planning for diversity and inclusion goals is essential for any institution, said McNair, who previously served as provost and senior vice president for academic affairs at Wagner College in New York. She also held teaching and administrative stints at Spelman College and the University of Georgia, where she was the first African-American woman to obtain tenure and promotion in the Department of Psychology. “Create broader awareness of the synergistic relationship between the campus and the community,” said McNair, who added that in her six months as president of the university founded by Booker T. Washington, she has worked closely with the city of Tuskegee on a range of issues that directly impact the university. McNair said that implementing a holistic diversity and inclusion vision for a campus requires an openness to change and an efficacy for change that requires buy-in from a number of stakeholders.